Michael John Moorcock (born December 18, 1939) is an English writer, primarily of science fiction and fantasy, who has also published literary novels. He is best known for his novels about the character Elric of Melniboné, a seminal influence on the field of fantasy in the 1960s and 1970s. As editor of the controversial British science fiction magazine New Worlds, from May 1964 until March 1971 and then again from 1976 to 1996, Moorcock fostered the development of the science fiction “New Wave” in the UK and indirectly in the United States. His publication of Bug Jack Barron by Norman Spinrad as a serial novel was notorious; in Parliament some British MPs condemned the Arts Council for funding the magazine. In 2008, The Times newspaper named Moorcock in their list of “The 50 greatest British writers since 1945”. Michael Moorcock has received great recognition for his career contributions as well as for particular works. 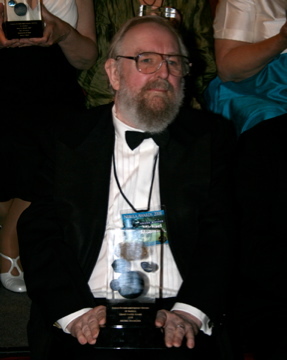 The Science Fiction and Fantasy Hall of Fame inducted Moorcock in 2002, its seventh class of two deceased and two living writers. He also received life achievement awards at the World Fantasy Convention in 2000 (World Fantasy Award), at the Utopiales International Festival in 2004 (Prix Utopia), from the Horror Writers Association in 2005 (Bram Stoker Award), and from the Science Fiction and Fantasy Writers of America in 2008 (named its 25th Grand Master).